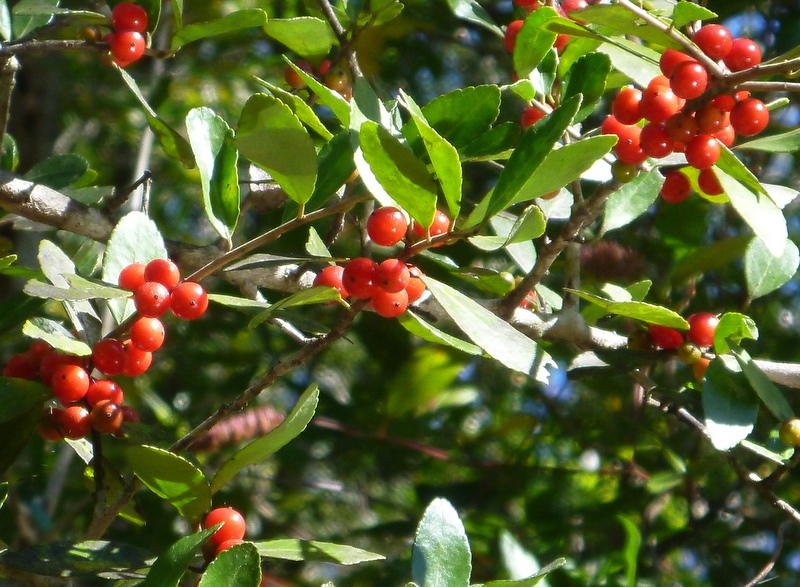 Dahoon Holly berries – Womack Creek – December 7, 2014. 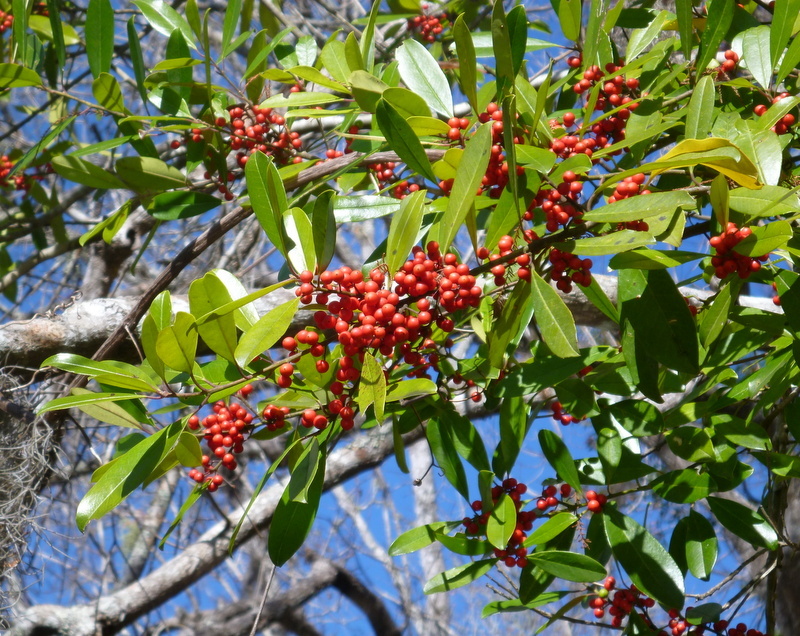 All three types of hollies on Womack Creek are red with berries: Yaupon, Dahoon and American holly. 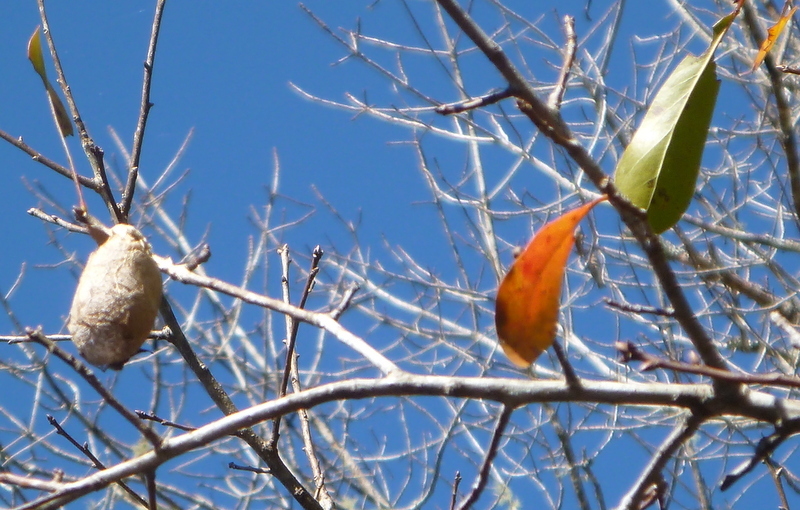 By end of winter, the migrating birds will have eaten them — fair trade for the color and liveliness they add. A pair of warblers are already on Womack Creek. 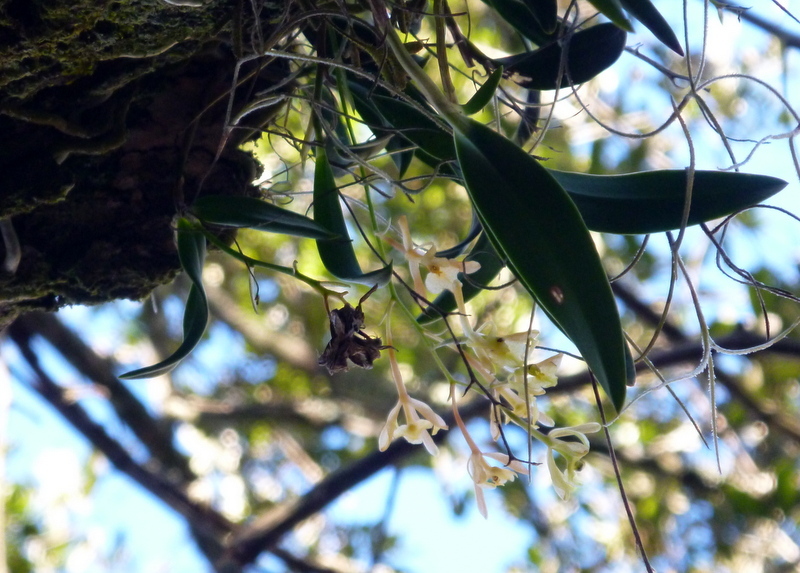 The greatest surprise, however, was a spray of blooming green fly orchids. These were in bloom in late spring and we were not expecting a spray in bloom this late into the year. The creek always has a surprise for us and today we were not disappointed. This is how the day started out — 62 F — blue skies, slight breeze. No insects, no butterflies, very little stirring such that a drop of a leaf catches our eye. Most of the leaves have been stripped from the deciduous trees, but there are still some red and yellow leaves clinging to their vines or branches. While Simmon’s asters are all in bloom, the climbing lavender asters are almost gone. 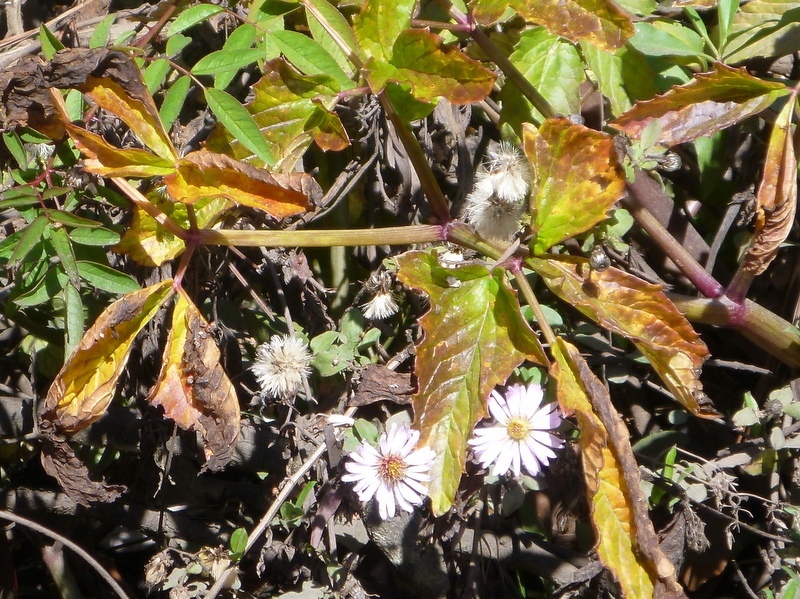 These few blooms, nestled against the toxic water hemlock plant, are the last of those vibrant fall flowers. 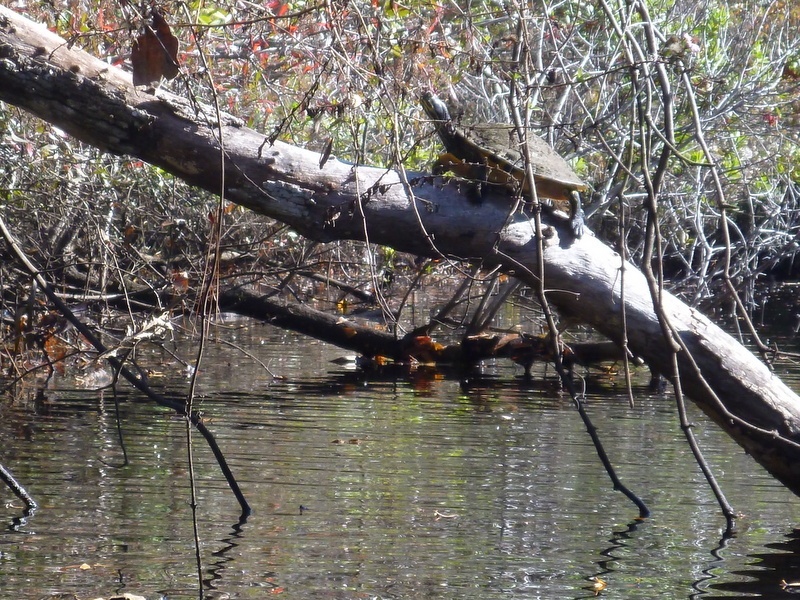 A few turtles were getting as much sun as they could — more large ones than small. We saw no alligators today. But there were buzzards, a pair of warblers, an anhinga, the sound of a woodpecker, a couple of ducks and at the entrance to the creek a grebe, the first we have seen on this creek. 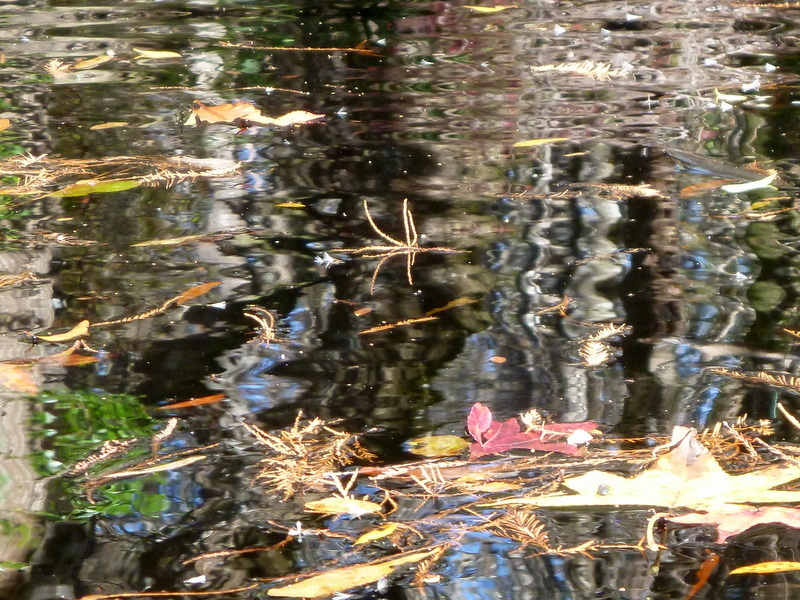 The cypress are losing their leaves; oak leaves are turning. And there are signs of the next season, already. 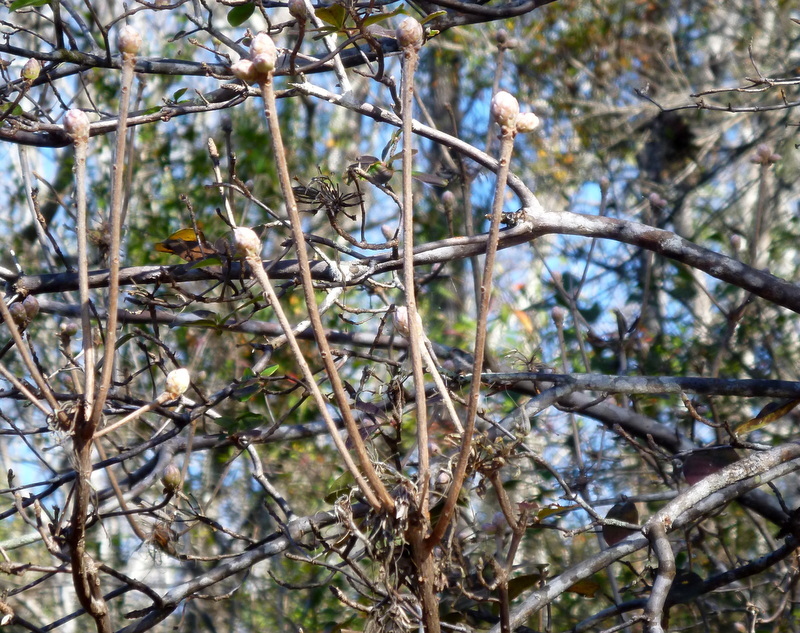 An egg sac, winterized and ready for early spring’s warm sunshine, even while this fall’s leaf still hangs on a bare-leafed tree. And next March’s azalea blooms already being packaged. This creek keeps on giving — and it leaves the year in a glorious display of red and green! 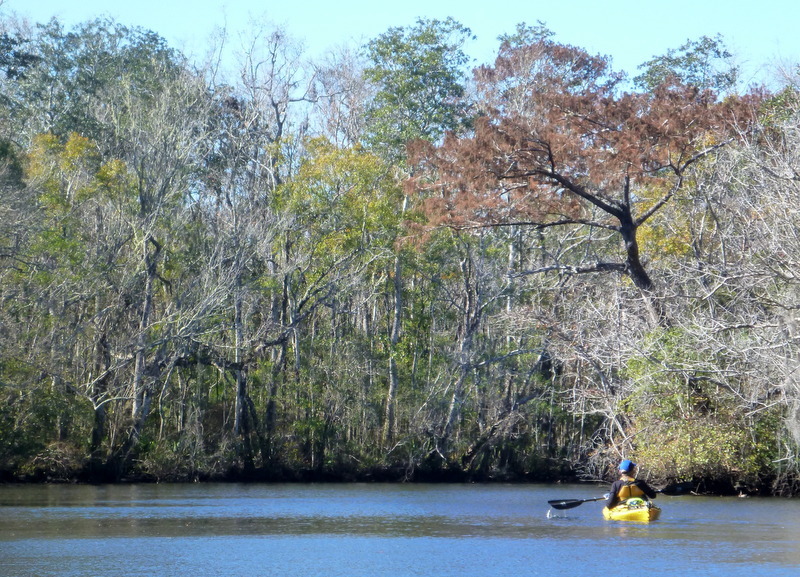 This entry was posted in Tate's Hell State Forest, Womack Creek and tagged Paddling Tate's Hell State Forest, Womack Creek, Womack Creek paddling on December 7, 2014 by marylynanded.